Nearly intact mammoth skeleton a rare find in L.A.
(CNN) -- He had a rough life during the Ice Age, walking around with a couple of broken ribs and a possibly cancerous lesion on his jaw before dying at a young age. 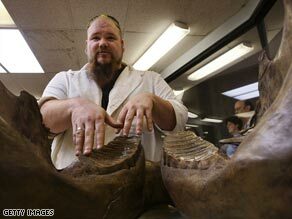 Assistant lab supervisor Trevor Valle discusses the teeth and lower jaw of Columbian mammoth fossil "Zed." Now, at least 10,000 years later, visitors in Los Angeles can see the remains of "Zed," a Columbian mammoth whose nearly intact skeleton is part of what is being described as a key find by paleontologists at Los Angeles' George C. Page Museum. Zed was discovered at a construction site in the heart of Los Angeles. An earth mover helping to build an underground parking garage near the L.A. County Museum of Art uncovered the mammoth's skull, according to project director Christopher Shaw. "The skull was hit and shaved off ... by a scraper," Shaw told CNN Thursday. "We don't know just how smashed up it is, but it's fairly intact because it's a huge jacket we put it around." The mammoth's fossil was found along with 16 other deposits at the site that paleontologists "tree-boxed" along with the surrounding dirt, creating 23 massive crates weighing between 5 and 53 tons that were then lifted out intact. Zed's remains were encased in a plaster jacket. The construction was being monitored by a consulting firm because the site is so close to the La Brea tar pits -- a site that has yielded between 3 million and 4 million fossilized bones. Construction on the parking garage began in 2006 but it took two more years for all the recovered materials to be handed over to researchers at the Page Museum, who began analyzing the various fossils in June, Shaw said. "It's very exciting for us because each one of these ... could be different ages in the past 10,000 to 45,000 years," Shaw said. John Harris, the head curator of the Page Museum, publicly announced the finding of "a whole new treasure trove of fossils" on Wednesday. He described it as "the most important discovery" for the museum "of the last 90 years." Shaw said the announcement was made to "create interest" in the museum's discovery. Among the most interesting items is likely to be Zed, who is believed to have died in his late 40s. Mammoths are thought to have had an average lifespan of about 60 years. Not all of Zed's remains have been cleaned off and analyzed. "Right now we have opened the plaster jacket of four sections that were excavated, including vertebrae and ribs and pelvis, one tusk and the lower jaw," Shaw said. "It will take another six to 12 months to open everything." Shaw said both of Zed's tusks were found intact, which is very rare. "Previously, we've found mammoths but the tusk material was very poorly preserved," Shaw said. "It's very exciting to us to have these two complete, beautifully preserved tusks." The excitement generated by Zed and the rest of the paleontological find could help boost the Page Museum's attendance and funding, which is key as many museums are seeing their attendance dry up during the recession. "The cleaning of Zed can be viewed inside the museum inside the 'fishbowl' -- a windowed area -- as parts of his bones are being cleaned," Shaw said. "So people come to see us and we've constructed small exhibits. It will attract a lot of people and that will help our funding situation." Researchers hope to have the entire skeleton on display by next year. Shaw said it is unique to have such a major fossil find in the heart of an urban center like Los Angeles. "I've always said we're kind of spoiled here in Rancho La Brea," he said. "It's not like going to the Gobi Desert where you can't take a shower for weeks." While the process of cleaning and analyzing the fossils is very intricate and time consuming, Shaw said it is a rare experience for researchers to come in to work and not know what they will discover that day. "Every day we come to work, we're uncovering things that haven't seen the light of day for 40,000 years," he said. "It's an exciting thing that we're doing just that."